This fall, NYSLRS published our Comprehensive Annual Financial Report (CAFR), with the latest data from the State fiscal year ending March 31, 2018. It’s a publication full of details about NYSLRS members, retirees and beneficiaries, as well as information about NYSLRS investments. In this post, let’s dive in and take a look at NYSLRS retirees and the places they call home. As of March 31, 2018 (the end of the State fiscal year), NYSLRS provides pension benefits to 470,596 retirees and beneficiaries. Six hundred ninety-five of them live outside the United States, in places like England and the Philippines. However, the vast majority live here in the U.S. In fact, while 22 retirees and beneficiaries have found themselves in the Great Plains of North Dakota, and more than 37,000 now make the sunshine state of Florida home, nearly 79 percent of NYSLRS retirees and beneficiaries — some 370,329 — live right here in New York. 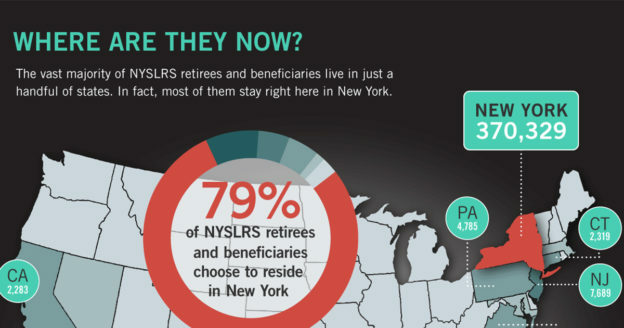 NYSLRS retirees live in our communities, in every county of the State. Their pension money flows right back into our neighborhoods, stimulating and growing local economies. In 2017 alone, NYSLRS retirees generated $12 billion in economic activity in New York State. They pay property taxes, state and local sales taxes, and they spend money at local businesses. In fact, in 2017, spending by NYSLRS retirees and their beneficiaries was responsible for the creation of an estimated 73,000 local jobs. NYSLRS has received a Certificate of Achievement for Excellence in Financial Reporting for the CAFR for the last 14 years. It’s a national award recognizing excellence in the preparation of state and local government financial reports. There’s more to find out about retirees, members and NYSLRS’ investments. You can check out this year’s CAFR and CAFRs from years past on our website. This entry was posted in Retirees and tagged CAFR, Comprehensive Annual Financial Report, Economic Impact of Retirees, New York State & Local Retirement System, NYSLRS Retirees, Retirees Contribute, Retirees Create Jobs, retirees pay taxes, retirees spending, Retirees Stay in New York, retirees support our economy on November 29, 2018 by NYSLRS. This is a very comprehensive report and I am impressed with the background work required to produce it. Many thanks for your reporting! Thanks, Robert! If you liked this post, you might also like this one about Keeping the Pension Fund Funded. Thanks for the updates. Very informative! i would like to know how many New York State retirees live in Denver Co? There are 711 NYSLRS retirees and beneficiaries in Colorado, 49 of whom live in Denver. How many pensioners leave the US entirely, and collect their pensions abroad? Inquiring minds would like to know! 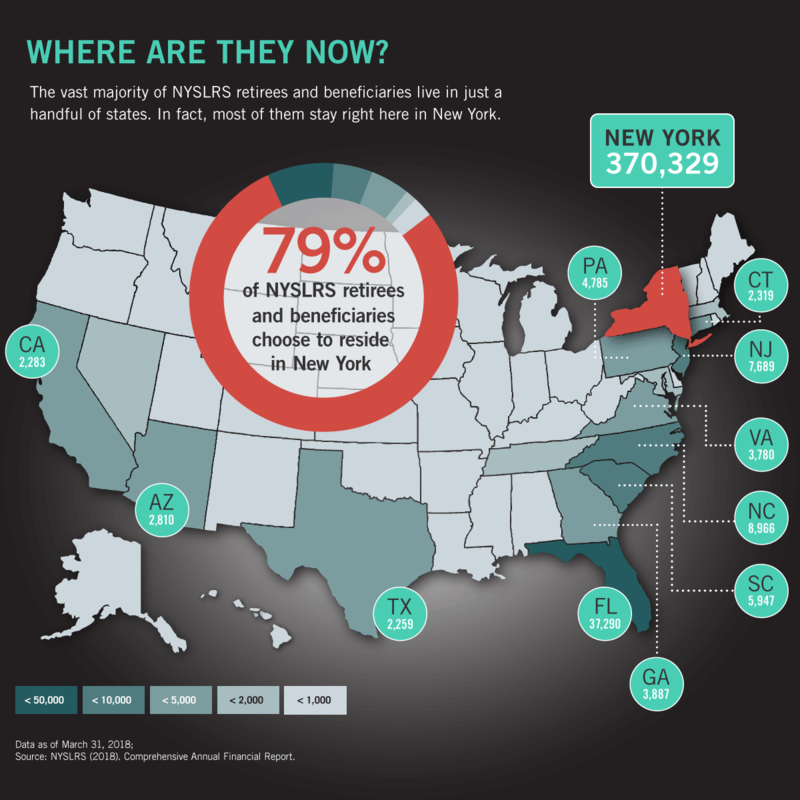 There are 717 NYSLRS retirees living outside the United States. Certainly. Information about how many NYSLRS retirees live in other states is available on page 30 of our 2018 Comprehensive Annual Financial Report. As of March 31, 2018, 1,852 NYSLRS retirees and beneficiaries call Tennessee home. Are the only east coast states that don’t tax our pension NY, NH, and FL still? There is information about the location of NYSLRS retirees and beneficiaries on page 30 of the 2018 Comprehensive Annual Financial Report. Information on how each state taxes pensions is available on the taxes-by-state page of the Retired Public Employees Association website.